With Full Channel and i-Guide on your High-Definition DVR, you can move the best shows to the best times in the best places! Schedule single recordings or an entire season. Watch the game and record your favorite programs on another channel. This is DVR like you’ve never seen before. You control the entertainment. 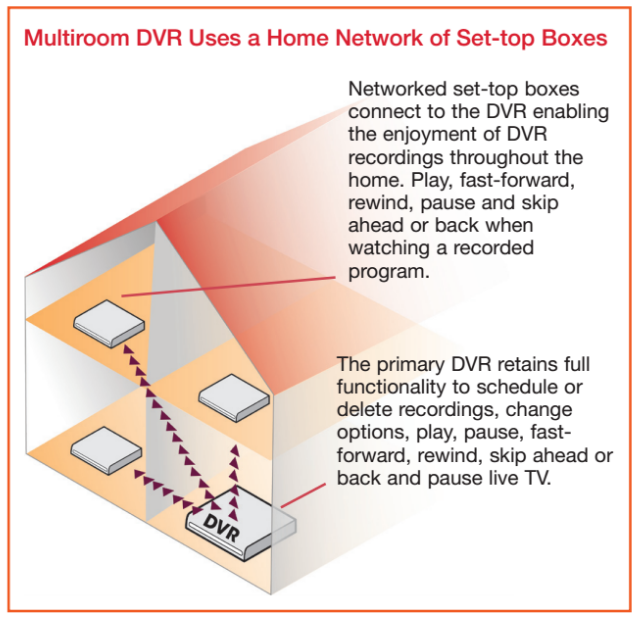 Access DVR recordings throughout the home – from the living room, to the kitchen, to the bedroom, on any set-top box connected on the home network. Watch different recordings, including HD, in multiple rooms. Stop a recording in one room and resume play in another. Add an additional 1TB of additional external video storage with the purchase of Western Digital’s My Book AV DVR Expander.